From "Double 8" to "Super 8"
The 8 mm movie camera series of Nippon Kogaku K.K., started with "NIKKOREX-8" (released in December of 1960 (in March of 1961 in Japan), see Part 18.) was followed by new products one after another according to the change of the 8 mm movie camera of the world. Especially big change broke out in 1965. It was the appearance of so-called "Type S" standard film. The 8 mm movie film up to that time was called "Double 8" and it adopted a complicated system that used film of 16 mm wide, and after 25 feet of the first half width of the film was finished, the film was reversed and shooting was made with rewinding the film. It was the means of simplifying this operation of "reversing the film" that the prototype prior to "NIKKOREX-8" introduced in the last part adopted a special film magazine. Then, a new film standard appeared, which eliminated this inconvenience using the film of 8 mm wide from the beginning, and that the frame size (area) was enlarged by 50 percent with decreasing the size of perforation (the holes for advancing the film). This was the film called "Type S". Such new standardization of 8 mm movie film had been proceeded by Fuji Photo Film of Japan and Eastman KODAK of U.S.A. separately. Both parties made mutual concessions in the way and the frame size and the perforation size were standardized as "Type S". However, the film cartridges were made separately as "Single 8" of Fuji and "Super 8" of KODAK, thus the cameras were separate, though the projector was common for both. As it was quite obvious that this new "Type S" film was superior than conventional "Double 8", manufacturers which marketed 8 mm movie camera all developed cameras adopting either "Single 8" or "Super 8" of these new standards. After examining these new standards, Nippon Kogaku decided to adopt "Super 8" in consideration of the dominant position of KODAK in export markets, and released Nikon "SUPER ZOOM-8" equipped with 5X zoom lens (see photo) in 1966, at the first step. 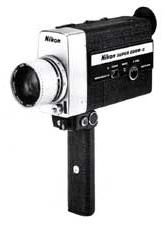 In September of 1967, the next year of the release of Nikon "SUPER ZOOM-8", the 1st Nikon 8 mm Movie Contest was held. This contest was held every year and was regarded as one of the leading contest in this world, but on the other hand, it seemed to be effective for sales promotion of 8 mm movie cameras as well, and after that, the sales of Nikon 8 mm movie cameras increased rapidly. 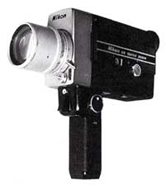 However, it was due to the influence of this contest more or less that the 8 mm movie camera of Nippon Kogaku, started with low-priced simple "NIKKOREX 8", was gradually changed its direction to the high-grade product. As a matter of course, rather advanced amateurs enter in this contest. We've heard that someone built a cottage annex to the main house exclusively used for his hobby of 8 mm movie, and another installed electricity as far as to the beach in order to film a marine turtle. These advanced amateurs require rather high performance even for 8 mm movie cameras. Nippon Kogaku changed its policy to such direction to cope with the request of these advanced amateurs as it released Nikon "8X SUPER ZOOM" that was equipped 8X zoom lens (7.5 ~ 60 mm) with relatively simple Nikon "SUPER ZOOM-8". For these advanced amateur film makers, it was the most dissatisfied thing with the film of "Super 8" standard that it "cannot be rewound". This is used for the technique of "overlapping". When a movie scene is switched to the next, it is nothing interesting if it is simply changed to another. With the present video equipment, we can enjoy various scene conversions using plenty of image processing techniques such as the change of scenes like turning over the pages of a book, or scattering of the image like a mosaic, but with a movie camera of that time, only such techniques as "fade-out", "fade-in" and "overlapping" could be made. It is "fade-out" that the image is gradually getting dark and finally disappears at the end of a scene, on the other hand, "fade-in" is that the screen is gradually getting light and the image emerges at the beginning of a scene and this "fade-out" and, "fade-in" of the next scene is made simultaneously is "overlapping". Therefore, in the "overlapping" technique, the part of change over is double-exposed. For that purpose, it is required to rewind the film once exposed by "fade-out" to a certain length, then the next scene is "faded-in" on that part of the film. This rewinding work was difficult with the cartridge of "Super 8". The cartridge of "Super 8" originally aiming at the home movie maker, had the first-priority in the easy loading and the compactness. As the film is twice longer than "Double 8", the diameter of wound film becomes larger. While "Single 8" of Fuji Photo Film avoided that by decreasing the thickness of the film base, "Super 8" of KODAK prevented the cartridge to become large by making the feeding spool and winding spool coaxial. 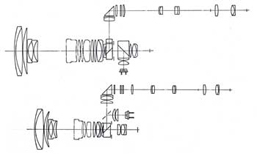 The coaxial mechanism of "Super 8" is valuable because it also makes the drive system of the camera simple, but this structure of cartridge made the rewinding difficult. According to a designer who was in charge of 8 mm movie camera at that time, he had heard of users' strong request for rewinding repeatedly at the time of attending the contest. He was puzzling if it is possible to incorporate the rewinding function in "Super 8" cartridge scrutinizing the cartridge from this angle and from another everyday. All of a sudden, an idea flashed across his mind some day. There are feeding film chamber and winding film chamber in the cartridge of "Super 8" and when the film is wound from feeding chamber to winding chamber after filming, some space is made in the feeding film chamber. When moving the film appearing at the aperture for shooting by a finger, leaving the drive axle of winding fixed, the film could be returned to this space of feeding film chamber as though it was folded in. "I made it ! ", shouted he and the entire room of the designing department was uproarious. For the purpose of "overlapping", it is not necessary to rewind all the film wound, but it is quite enough to return this length that can be folded in this space, and "overlapping" with "Super 8" can be possible by utilizing this. He says that the excitement of that moment when this idea came across to him is clearly brought back even now. The next thing to do was to apply patents. Very strong patent net was formed by basic patents as well as peripheral patents. This group of patents is called "R" patents inside Nippon Kogaku and the story is handed down up to now as a model case for patent strategy at the time of product development. "R" patents was unrivaled for its superb idea. 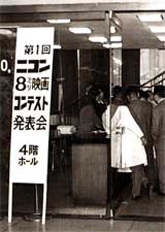 Therefore, it was possible to obtain the exclusive possession of that technology if so desired, but Nippon Kogaku took the policy of licensing the patent to others giving priority to the expansion of the 8 mm movie market. Licensees range from Japanese to European manufacturers and a good many "Super 8" cameras with the rewinding function were released. After making thoroughgoing preparations, Nikon "R10 SUPER ZOOM" and Nikon "R8 SUPER ZOOM" were finally released in 1973. In contrast to former times, they were intended to be high-grade models aiming advanced amateurs from the beginning with such features as fast zoom lens with high magnification, macro mechanism covering full range, reverse shooting, variable shutter opening angle, and so on. They were welcomed by high-level amateur movie makers, as planned at the beginning, and sold well. In addition to "R10 SUPER ZOOM", the highest-grade model, "R8 SUPER ZOOM" succeeding the conventional "8X SUPER ZOOM" was released at the same time, and contrary to our expectation that moderately-priced "R8" would sell more, expensive "R10" sold more. The "overlapping / rewinding" function, the strongest selling point was automated as far as possible and its operation was simplified. However, inside the company, there were many people who have the opinion that "its operation is too difficult", mainly among senior people and the plan was almost rejected. Development members made a narrow escape with their enthusiasm. In the market, the evaluation of "simple operation and high performance" was dominant, and development members were pleased with it as "their intention was understood". Nikon "R10 SUPER ZOOM / R8 SUPER ZOOM" were favorably accepted and won the fame of excellent models, but they were the last models of the 8 mm movie camera of Nippon Kogaku, as a result. 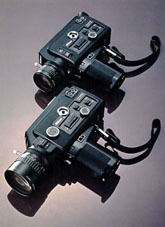 "Super 8" cameras with sound recording were developed and released from various manufacturers. Sound-recording model had been prototyped in Nippon Kogaku as well. This prototype of sound-recording model was to be a well-shaped, ultra-compact camera of simple operation equipped with 6X zoom lens, but it never made a debut, and Nippon Kogaku completely gave up the movie camera business in 1979. There had been a growing trend to switch over to the home-use video camera, and the discontinuance was made foreseeing that. It was a right decision, on looking back upon from now, but it was a very regrettable discontinuance for many people concerned. This issue first appeared in Nikkor Club Quarterly magazine published by the Nikkor Club, and was revised for Nikon's website. The names of companies and products are registered under said companies' trademark and copyrights.